provide guests with a pleasant and cozy atmosphere, comfortable rooms and excellent gastronomy. 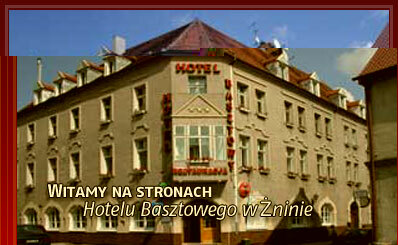 Situated close to the route from Poznan to Bydgoszcz makes the hotel can be easily reached. Close to the bus station to the hotel asset. There are rooms 1 -, 2 -, 3 - and 4 - bed rooms and one suite. 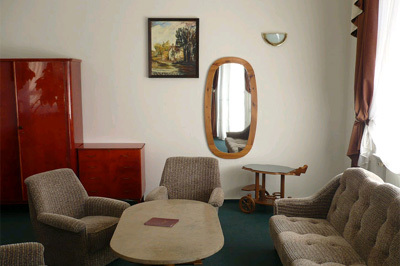 All rooms are equipped with private bathroom, telephone and satellite TV. For an additional fee, you can stop with your dog, provided that it will not disturb the peace of other guests. Check-in begins at 12 noon and ends at 12 noon the next day. For guests there is free parking! Parking is guarded and monitored for 24 hours. In the restaurant guests will eat a meal flour. You can taste the specialties of Pałucka cuisine. Restaurant Guests can choose an orange or red. Orange Restaurant provides delicious dishes of Polish and European. 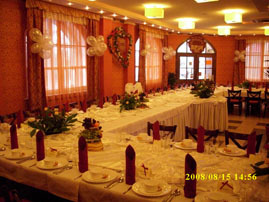 Red Restaurant is famous for its Italian cuisine. The well-stocked bar is a place where guests will spend pleasant moments by the fireplace while enjoying delicious drinks. The hotel is located in the very center of Znin.